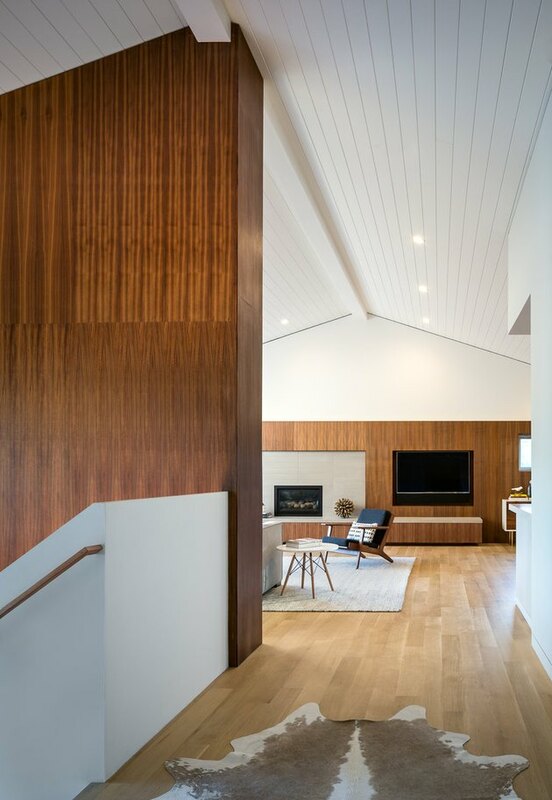 When a couple in Greenbrae, California contacted building Lab for a renovation, they had what would appear to be a reasonable request: to nix their home's wood paneling. Even though they were adamant about maintaining most of the property's original architectural elements, they thought of this feature as being too dated for their vision. But the designers had a different idea. 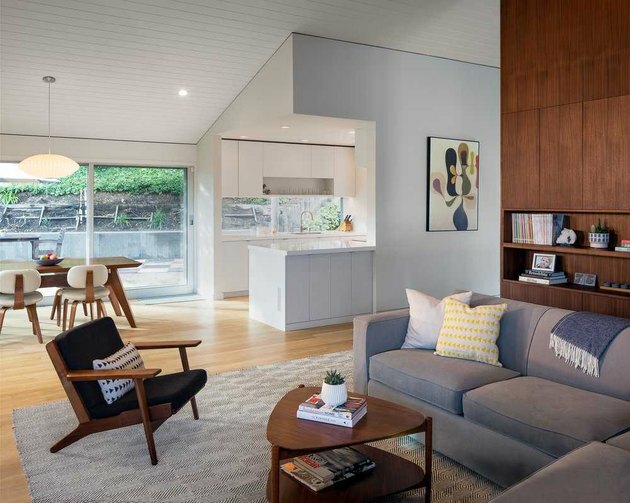 "When this house was built, paneling was thought of as an interior skin, so they were installed everywhere," said principal Stephen Shoup. "In this redesign, we aimed to have a reinterpretation of paneling: echoing the original concept, but making it more strategic." The new layout of the 2,200-square-foot address had to be strategic, too, since the owners also requested an efficient open concept for their two young boys. So, the firm came up with a plan: keep the original footprint of the main level and add a mere 15 square feet to the lower level. 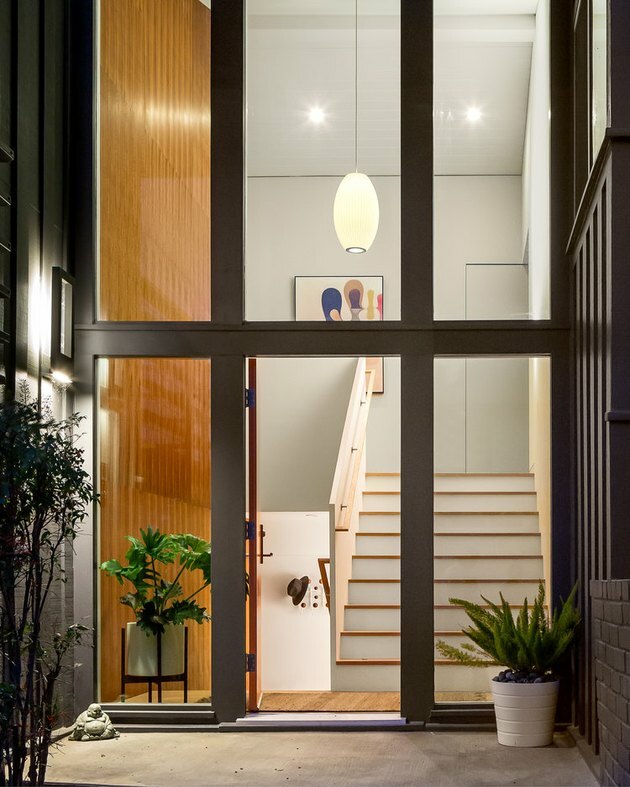 Then, senior designer Hide Kawato and the team optimized the area with improved lighting, natural materials, and less of a barrier to the outside world. When they were finished, the firm and the family had happily reached a compromise that set a modern standard for a midcentury aesthetic. A hanging light from Nelson Cigar is paired with plants, art, and a wood wall at the entrance. Custom walnut shelves and storage units match wide-plank white oak on the floors. A curved floor lamp by CB2 adds to the midcentury vibes. 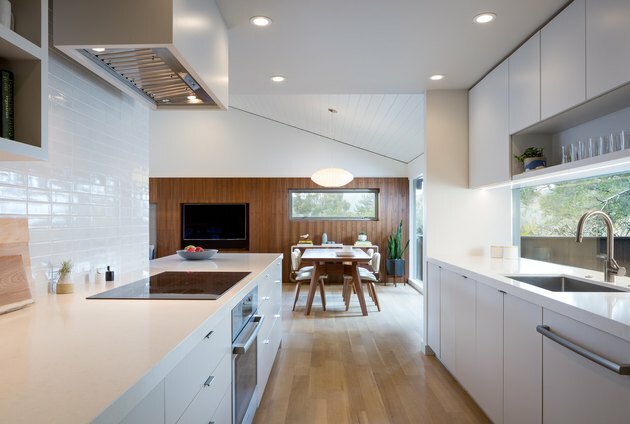 "The new tongue-and-groove ceiling is also a nod to the typical midcentury practice," Shoup said. The ceiling is painted "Simply White" by Benjamin Moore. Building Lab set out to prove that walnut walls and light-colored paints looks modern, not dated. A chair by Organic Modernism and coffee table from West Elm sit next to a Room & Board sofa. 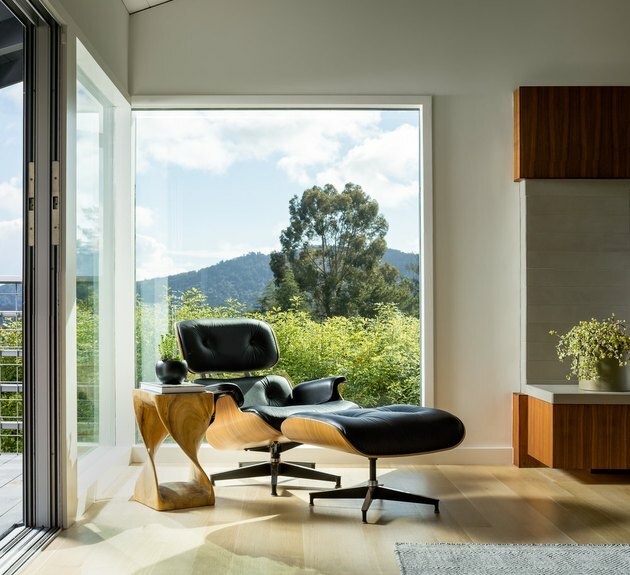 An Eames Lounge Chair provides a comfortable place to sit behind sprawling views of the Northern California landscape. Maple cabinets with an opaque white varnish complement Caesarstone countertops in the kitchen, alongside a Grohe Concetto SuperSteel faucet. A dining room table and chairs by Gus Modern sit amongst the wood-paneled background. 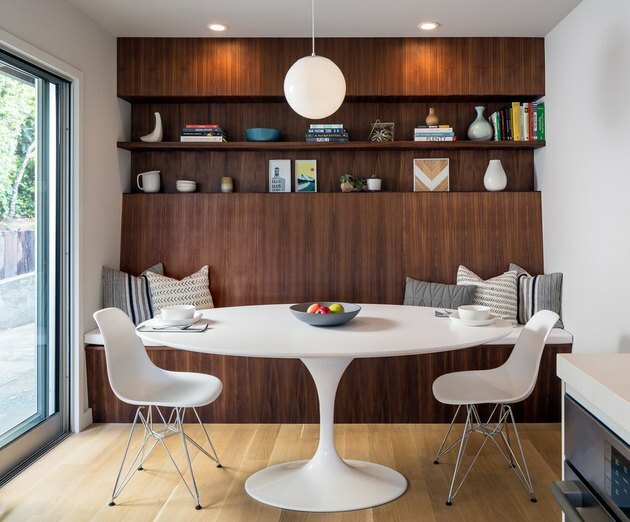 In the dining nook, a white Saarinen-inspired table by Rove Concept is coupled with Eames Molded Plastic Wire-Base side chairs. 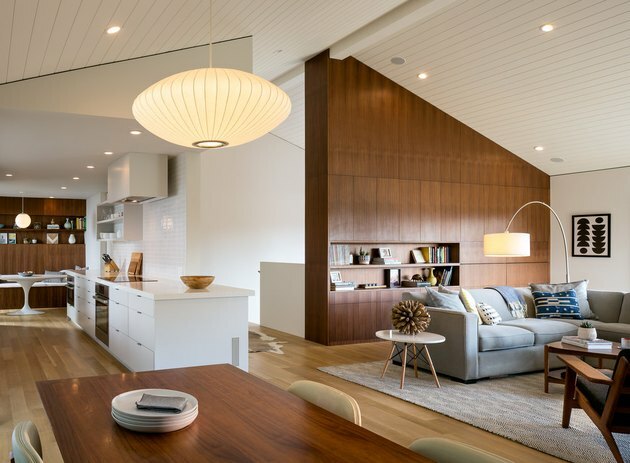 A ball pendant lamp by Schoolhouse Electric hangs overhead. 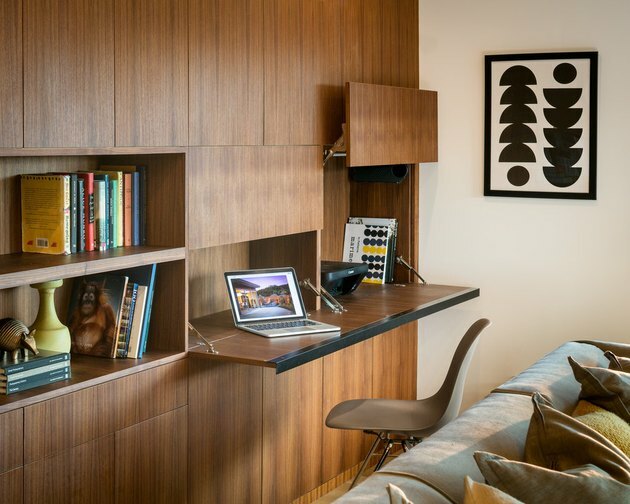 An Eames molded plastic side chair is the perfect contrast to the custom walnut built-in desk of the office. 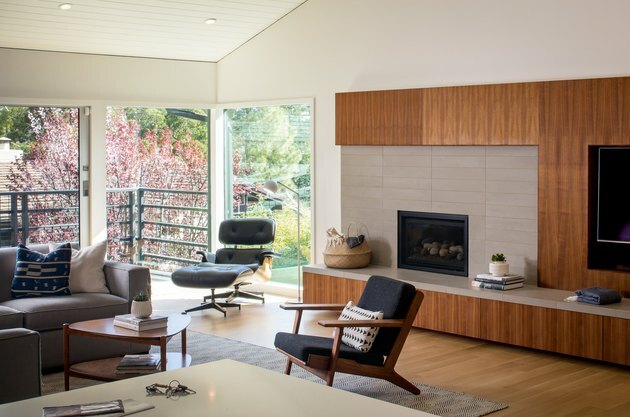 The designers replaced a traditional wood-burning fireplace with a gas one from Kozy Heat.